Has anyone heard of Tristar tools? 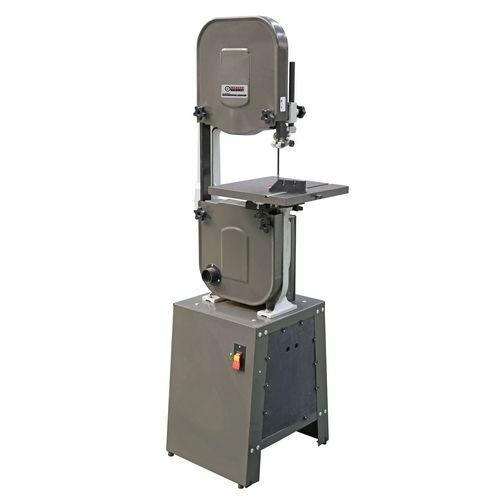 I have a chance to trade a old craftsman 12” band saw for a Tristar 14” band saw. I have searched and searched and the only thing I can find is one being sold on a auction site. It looks a lot like the buffalo one on a different forum on here and the one they sale at harbor freight. Its a Model VBS-14. the one on here is Buffalo Band Saw BP-VBS-14. I think this is the same saw but under a different name with the BP added to the model number and now its sold at Harbor Fright as a Central Machinery. Has anyone owned one of these or know anything about this brand? I know it not going to be a great saw but it looks like it is built a lot stronger then this old craftsman. Any input would be greatly appreciated. -- Jesus was a Carpenter too!!! 1) Power switch is inconveniently located on the base, not on the upper arm casting. 2) Multiple speed pulleys are sort of a challenge to get aligned/tensioned, and aren’t really necessary. 3) Stock belts are junk. Replace with link style belts. 4) Base design/assembly takes longer than one would think (really bad instructions). Needed additional base re-enforcement to quiet vibration. 5) Original blade is adequate, but should be replaced with a better blade. 6) Miter gauge is cheap junk, miter slot isn’t the same 3/4” size as what would be on a table saw. 7) No pre-drilled holes for mounting fence. 8) Built in dust port is barely functional. 9) Blade tension rod is too short for my liking. 10) I tossed the orignial steel blade guides and added Cool Blocks. The HF uses the square blocks on the upper and the round blocks on the lower. So you need to order two different sets. Tri Star International was an importer of Taiwanese machines, along with several others long since out of business. They were located in St Louis. I have one of their 15” planers and it’s a basic Gee Tech machine.